Bring your garden to life by attracting and feeding hummingbirds. Rufous hummingbird flying and drinking nectar. It’s that time again. You’re wandering around the garden and you hear a familiar buzz racing past your head. They’re back! It’s time to pull out the hummingbird feeders. 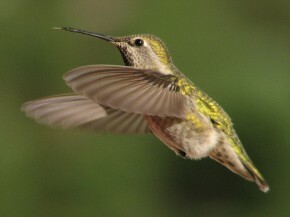 Vancouver Island is home to only two species of hummingbird, caries the Rufous and Anna’s Hummingbird. The Rufous Hummingbird is distinguished by a buffy cinnamon coloration on its body and tail. Like all hummingbirds, disorder male Rufous have iridescent throat feathers, called a gorget. When the light catches it, the male Rufous gorget is a striking orange-red color. Females are greener, and have spots of iridescent feathers on the throat. The Rufous is by far the most common species in our area. They arrive with the first flowers of the spring, breed here, and depart by mid summer. The Anna’s Hummingbird is much more elusive. The Anna’s male has a fuchsia-pink gorget and a green back. Both males and females have white over the eye, and no hint of cinnamon. Anna’s have only been in BC for around 60 years. This native of California has gradually moved north, expanding its traditional range. Anna’s reached Vancouver Island in the mid 1940s, and a breeding record was confirmed in 1958. Since then, Anna’s have been steadily increasing on Vancouver Island, especially during the past five years. Anna’s Hummingbirds were first recorded in the Comox Valley in the late 1960s. No matter which hummingbird species is found in your area, there are several key factors to consider if you want to invite these fascinating little birds into your garden. All hummingbirds share similar requirements for a welcoming habitat: food in the form of insects and nectar; water collected on large leaves for drinking and bathing; shelter from adverse weather and for nesting sites; and material to build their nests. 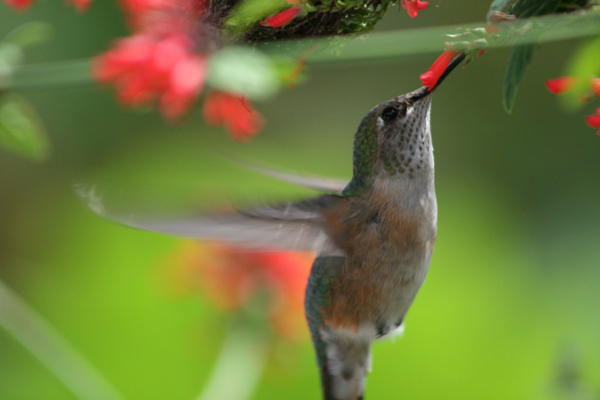 Flower nectar is a natural food source for hummingbirds. In return, hummingbirds pollinate the plants that provide it and help them create fruit and seeds that may feed a host of other birds later in the year. Hummingbirds are important pollinators for many flowering plants. Hummingbirds will feed from any color, but may visit red, purple, blue and yellow flowers first. The more the bloom color contrasts with the flower’s background, the more likely a hummingbird is to visit. Because of their long tongues, hummingbirds show a preference for bell or trumpet-shaped flowers. You can keep those hummingbirds coming from spring until fall if you garden with plants that will give these birds a natural and complete food source. However, if you wish to supplement this primary food, you can add a feeder or two. To make your own hummingbird food, mix one part white sugar to four parts water. Allow the water to boil for one minute and then add sugar. Once the sugar has dissolved, remove from the heat and allow the mixture to cool thoroughly. Fill your feeder and store any excess in the fridge for up to three or four weeks. Do NOT use honey as it may cause a tongue fungus, nor artificial sweeteners as they provide no sustenance for birds. Also avoid food coloring as this only adds chemicals to their diet. The red on the feeder will attract hummingbirds. If, after a couple of weeks, you don’t have any takers, move the feeder to a more visible place and consider other ways to entice hummingbirds to your garden. Keep feeders clean so your visitors don’t get sick from a build up of bacteria. Clean every three days—more often if temperatures are high or if it is in the sun . Although it may not look dirty, this sugary solution can go bad very quickly, so clean regularly. Cleaning doesn’t have to take long—a swish with a long brush inside and rinse with hot water. If you use soap, be sure to rinse the container very well. Keep the feeder in a spot where hummingbirds won’t get hurt. An open area will allow them to spot approaching predators, such as house cats. If your feeder doesn’t have a perch, you may want to put it near a tree or shrub for perching and shade. Hummingbirds are truly fascinating creatures. Their diminutive size, high energy, great agility and vibrant coloring make them wonderful visitors to any garden. A little bit of effort in providing some good hummingbird habitat features helps attract and encourage them to your home.